Ohana is a Hawaiian word that means family. Just watch a “Lilo and Stitch” movie and you will know just how important the ohana is here in Hawaii . 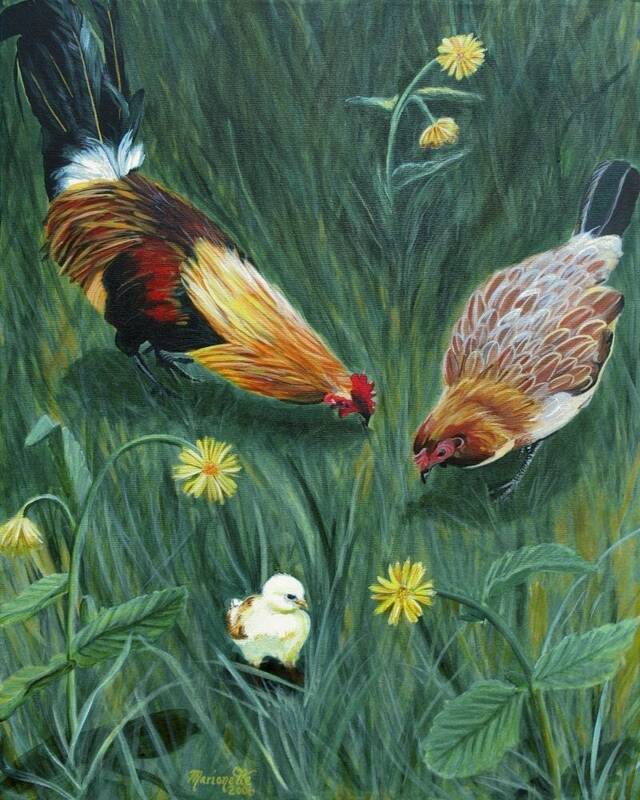 This painting represents the chicken ohana – the rooster, hen, and baby chick. There is no doubt that wild chickens are an important part of the life and culture here on the Garden Island of Kauai. "Chicken Ohana" - This giclee print is signed by the artist and is printed with archival inks on radiant white watercolor paper. It is a reproduction of an original acrylic painting and comes packed in a clear sleeve with a backing board (unframed). Colors may vary slightly from monitor to monitor.